Brothers Rice is an award winning family owned and operated Company specialising in Rock and Boulder Walls. Custom designed and built Rock walls, Boulder Walls and sandstone retaining walls can be seen on thousands of our residential and commercial projects throughout Southeast Qld and Northern NSW. Brothers Rice uses only the highest quality grades of Sandstone, bush rock, and Granite to construct their boulder and rock walls. Other materials sourced by Brothers Rice Constructions include but not limited to, basalt, Blue Stone, and onsite local rock. These materials as Bi products of whole Boulders can be used as landfill, Road base and landscaping supplies for smaller works. “Our walls stand the test of time by using the best products available” Quality Beaudesert sandstone, mined here on the Gold Coast, produces some of the most outstanding retaining walls. The beauty and durability of this product is unparalleled. Queensland Sandstone, the supplier of the product, is able to provide us with dimensional cut blocks for a formal retaining wall. Random cut blocks can be used for a sturdy, aesthetic wall at a more affordable price without compromising the quality or durability. For a more natural and rustic feel, bush rock can be used as the primary construction product. Our walls can be seen in many prestige commercial projects as a testament to our commitment and quality we strive to achieve. Rock Walls in Brisbane - We continously expand our reach to places like Brisbane for exeptional rock retaining walls and specialise in A Grade Sandstone. Ipswich is another place we deliver services to. 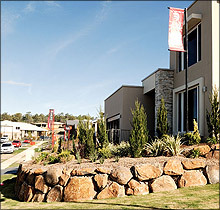 Rock Walls Ipswich is a greater area from Brisbane where we can service. We have had many projects in both Brisbane and Ipswich over the years. Click to view or download your copy of the Brothers Rice Brochure. Brothers Rice landscaping is an award winner and the industry leader in both the design and construction of rock retaining walls, with projects spanning from Northern New South Wales, the Gold and Sunshine Coasts and Brisbane. Brothers Rice utilise their own extensive fleet of Sumotamo Excavation equipment to ensure the quality of your rock and boulder retaining walls are of consistently high quality. Making use of space on acreage properties is an advantage but sometimes we are not quite sure what or how to do it. Let Brothers Rice assist you in designing areas for you to enjoy. tennis courts, multi level landscaping or foundation areas for patios.